Apologies for the delay in updating the installation of the MX5 seats, as is normal with such jobs, once I started it took way longer than I expected due to discoveries along the way..
First job – whip out the old seats and carpet.. This revealed two things. Firstly a floor like Swiss cheese, this car has had other seats before… No bother, weld up the old holes and mark out some new ones. The next problem was on the transmission tunnel platework. The tunnel itself works as a torque tube. When new the box section frame has steel panels welded to it to increase stiffness. Mine was held in with self tappers on the top rail and, wait for it, mastic on the lower flange. I’d like to point out at this point I’ve used the words stiffness and flange in the same paragraph and have, so far, avoided a cheap gag – is that another one? They fit where they touched and were entirely unacceptable. I decided to have new platework made and set about making a wooden template that I could later measure and then draw up. By the time the side piece was complete it was just too complex to do an accurate job. I decided to go the other way and get some basic profiles folded and cut them to size in the garage. Sadly I didn’t take any photos of the profiles but once the grinder came, out with a cutting wheel, and lots of measuring later, the pieces started to take shape. Moving over to the passenger side, the story was the same, and, oldy enough, the solution was the same too. I made an access panel to allow me to get to the overdrive solenoid easier, but other than that, same deal. I elected to go rosette welding on the floor and lap welding on the frame work. but before getting the MIG out, I painted the inside of the panels as access is mostly non existent once fitted. The 10mm bar tacked to the floor serves two purposes, I needed some clearance for the thicker seat swab so I decided to weld the bars to the floor to provide some re-enforcement. I’ll do yet another test fit before I finish weld them. Its getting colder, salt is appearing on the roads and its time to admit winter has arrived. Its a time to be joyous though, over the summer months and circa 3K miles one or two “improvement opportunities” have presented themselves. Here’s to many nights of tinkering in the garage. Firstly though, lady Marilyn became a show car this past November. Along with two of her sisters she graced the Challenger stand at the NEC classic car show. I was very proud. Its the first time I’ve manned a stand at a car show. To all the lovely people who visited, asked questions and shared their stories – it was a pleasure to meet you. To the odd one or two dickheads who visited to insult our cars – may you next turd be a headgehog. It was a cold November day when I drove to the NEC, roof down of course, and, as always, the old girl ran like a dream. I did think when I got there that I could do with more comfortable seats and there started the list. Seats are on the list for sure, as are a refresh of the half shafts. I elected not to do these during the rebuild and have regretted it ever since. So they’re on the list to. Also, there are bits of trim that have overly much patina for my taste, so a minor re trim is required. Then there the boot that needs sorting, the new fuel pump, throttle cable upgrade, the exhaust orientation at the rear. That little lot should keep me out of trouble for a while. Easy as that really. Wait a week and slot them back on. Next, the seats. There’s a lot of classic car chatter about using the Mk1 MX5 seats in E Types (along with TR6’s and others) so I picked up a pair on ebay to get them a try. The seats feel OK when just laid in place, but I wont know for sure if they’re OK until they are bolted down. Bolted down… hmm first issue. The MX5 doesn’t have a flat floor pan and so the runners aren’t flat either. At the front of the seat the runners turn down for the mounting position, at the rear they turn up. Neither works on my flat floor… Plus they have a peg arrangement that locates in the a special detail on the MX5. PS ignore the steel block, that was just me thinking of solutions…. So I set about modifying the MX 5 runners. Measure about 10 times before cutting anything. Here’s the front mounting cut off and the peg un-riveted. Next was to tackle the other end and decide on mounting locations. 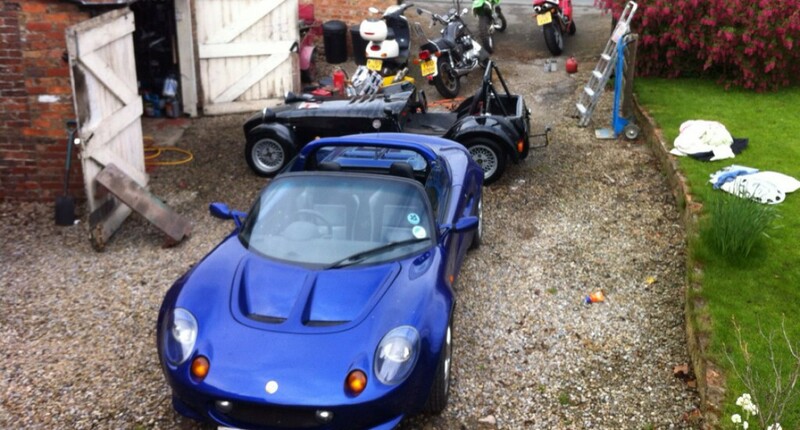 and positioned the MX5 seat in the same spot. Loads more comfort, recline adjustment and better hood clearance. Just the ticket. I’m going to do some welding next, so no fixing positions just yet but making sure they did fit both the car and me was an important first step. Lister was enlisted to move some unwanted furniture recently. Normal run of the mill stuff. However, by the time I got home, Lister had developed a cough at idle. Well to be more exact, at idle, Lister would cough and then stop. He’d restart immediately and run well on revs, but no idle..
Its the idle jet then. First things first, sprayed WD40 around the manifold and hoses with the car running on choke. WD40 makes the revs rise if its sucked into the combustion chamber, however this made no difference. theres a grub screw used to lock the jet holder in place (item 22) release this a few turns first. Equally poor photo but I hope you can see the difference. Put it all back together with 1 1/2 turns on the air screw (from fully in) and drop it back on the manifold. Nice and easy job done. When I bought the car, the roof came with it, not on it as you might expect. When it came to be fitted it was evident that it hadn’t been fitted before as the brackets were all in the wrong place. Once that was overcome I had some minor protection from the rain, but at a cost. In this case the cost was visibility, bit of an issue if you don’t have wing mirrors – and I don’t. The rear window was foggy/misty/boarder line opaque – pick your description, but whichever description you use, I couldn’t see out of it. Here’s a photo from within the car, looking out the rear. With visibility this good, driving with the roof up consigned me to the loser lane on the motorway, along with the lorrys, road traffic wombles and elderly aunt Nelly in her Nissan Micra. I intend to have the roof repaired (there are other fitting issues with it), or perhaps replaced entirely, but there a waiting list at the trimmer and what happens if I’m out in the car and theres a down pour? I’d read somewhere about using T-cut to restore these Vybak windows, had to be worth a try – it couldn’t possibly be any worse. The results are little short of incredible. its actually better than the photo looks as I’d picked up some reflections on this short. I doubt many will have a rear window anywhere near as bad as mine, but the principle of polishing with a very mild abrasive works well on this material. I’ve since found someone of the internet who swears by pledge (but, for some reason, not the lemon variety) to keep the window in tip top nick. Lady Marilyn had a slight vibration around 1500 in OD – this puts it at around 60 MPH and right in the spot where you spend most of you B road cruising. Its not been a massive issue, more of an annoyance really. The engine is as sweet as a nut so it was something from the gearbox onward. So up on axle stands she went for a nosey around. on closer inspection one of the bearings has been spinning in the casting, so it was in definate need of a rebuild. I took it to some nice people at D & P Propshafts and they said they’d turn it around in a week or so. Sure enough a week later it was all done and looking resplendent it its new paint. As there was wear in the casting it needed a new slider, which it got along with new bearings and a balance. Nice an easy job and another improvement ticked off the list. Now Lady Marilyn is on the road and munching up the miles, shes passed from a garage project to that Utopian state of a road going old British Sports Car – in other words she needs fixing a lot. At first thought this might seem an odd thing to long for, but think about it, we leap into our Euroboxes for dull an uneventful transport (otherwise known as reliable) experience. In a British sports car its a sense of occasion, a sense of style and a sense that that noise really shouldn’t be there…. In the old days, when I started the rebuild every time I tried to fix something, something else goes wrong. But now, all the hard stuff is behind me and we’re in the tinkering zone. As the odd little peculiarities pop up we turn to the trusty spanners get stuck in. Compare this to our daily drivers where we turn to the dealer and go broke. Fixing things is joyous and the little things give us an opportunity to see immediate improvements for a few hours work. The following little jobs have brought untold joy to Trevs garage. One potential problem I discovered was an issue turning left from a standing start. This isn’t a particularly unusual thing to want to do, so reach for the spanners and have a look. What has happening was the engine has now settled into its preferred position, in so doing the number one carb float bowl (nearest the bulkhead) has closed up distance wise to the first UJ in the steering linkage. Add a bit of engine tourque when setting off and the float bowl came into contact with the the high point of the UJ. and this cured the problem. A neater plate follwed as a final fix. Given the exhaust system was all newly assembled, there was a minor leak where the down pipe met the under body section. A bit of aluminium tape sealed that while the carbon had time to take up residence. However, it seemed to get worse, so another investigation uncovered a leaking manifold plug. There are two of these, on on each manifold and I have no idea what they are for, must be a test point of some sort. Anyway, one of them was blowing so I thought I’d take my strsty spanner an nip it up. It didn’t so much nip up as fall off. Happily the boss in the maifold is suitable to tap M6 and so a few minutes later the redundant post was replaced with a nice new screw. Below the boss is reinstalled next to an example of the test port on the other manifold. I’m not messing with that one, its a tinker for another time. The fuel gauge hasn’t worked since Lady Marilyn was put back together. Shorting the terminals at the tank end gave a full scale deflection so the gauge and wiring were OK, the sender must be buggered. Once or twive in the first few hunbdered miles the fuel gauge would burt into life again, for a few miles, before going back to sleep. I checked the serial number on the sender (TB9006) and its a top mounted version that was used. These are plentyful and cheap on the web, so I ordered a new one. I then fine tuned the sender arm shape by running the tank very low and adjusting the arm until I got ‘E’ of the gauge. I sealed it with blue Hylomar both side of the cork gasket. There are differing views on this, some say a dry gasket is better. All I can say it mine does not leak using the sealant. I also put a dab on each thread when re assembling as fuel can capillary along the threads and cause a slight weep. Word has it that there may be a customer stainless tank being designed by a club member, it this turns into a part then I’ll replace the tank and fuel line routing. I decided a quick road test was in order and as I backed out of the drive a cloud of steam engulfed the from of the car. Engine off, roll back down the drive and investigate. and dumped about two gallons of OAT mix on the drive. All the hoses were new during the build and there’s no bead on the stainless pipes. A quick check of the other jubilee clips found them less than tight too. So, I put the event down to the hoses settling after a number of heat cycles and duly replaced the hose and tightened up all the clips. Its done another 700 or so miles since with no issues. Its a good idea to go round everything with a spanner after a few hundred miles to ensure nothing else has settled in the same way – after all there were a lot of new fasteners used on the build. More tinkering to come, but for now, thats all folks! When scowering ebay for new clocks to replace my miss matched items I came across a set from a MK10 which looked in decent condition, pending a repaint of the bezel. My knowedge was lacking somewhat and I assumed the tacho would be a standard type that counted the pulses from the coil. Oh, but that would be way too easy. Instead Jaguar decided to fit a generator to one of the camshafts and use the tacho as kind of a volt meter, the faster the engine ran, the greater the output from the generator and the higher the tacho read. Later the R&D department would decide that a gearbox driven speedo was way to simple and propose a new device which unravelled a piece of knotted string with a lead weight on the end, coupled with a sundial and an abacus…. and connected it back to the module as instructed. add a positive and ground the attach the supplied signal cable to the computer headphones socket, one wire to ground one to the module signal feed. This last bit is used for calibration and uses an audio file at a given frequency to set the tacho needle via a small screw that can be seen top right of the module. This dry run was to prove everything worked. next step is to properly wire and solder the leads. I soldered new leads directly onto the Tacho coil. Note – there are no other wires now, just the new leads straight to the tacho drive. I put a blob of silicone on the dial to hold the wires away from the movement and left it to set overnight. I’d made a school boy error and snipped the old electronics from the board. The board is used to mount the drive at the rear via 2 screws and the bit i’d snipped off filled the hole where the old terminals were. I used some duct tape (on both sides) to seal the hole and made a small hole for the leads such that they were tight to pull through. next to calibrate the unit with the help of Spiyda’s downloadable sound file. Then put it all back together again and put the unit back in the dash. This conversion really is ridiculously easy, the instructions are as clear as day and theres some help videos on YouTube too. Once re-installed it works like a dream. Spiyda will do all this for you for a very reasonable £95, but its an easy DIY job.